NEW YORK, N.Y., Jan 04, 2017 (SEND2PRESS NEWSWIRE) — What types of advertising media, such as radio, television, and online ads, rose or fell in popularity in 2017? What are the main demographics advertisers target? Which moods and inflections are most sought after for resonance and persuasive power? To answer these questions, Voices.com has released their look at the media and advertising trends that will dominate over the next year. The 2017 Trends Report illuminates how the North American media and advertising landscape is shifting – as told by the voice over industry. Choices made in the voice over performances – such as the characteristics of the actor, or the artistic direction of the read – have been demonstrated to be a leading indicator of changes in consumer behavior and greater shifts in the media and advertising industry. The report is a reflection of a survey that was reviewed by creative professionals all over North America, and was conducted via email and one-on-one telephone interviews. Additional insights were provided by a focus group of voice over casting specialists who service a wide variety of industries, geographies, and client types. Research participants were creative professionals who are content creators, holding roles such as producers, directors, advertising executives, CEOs, business owners, freelancers, and more. 1) While apps may have appeared to be the promised land several years ago, in 2016, almost half (48 percent) of respondents said that apps weren’t worth producing or relevant to their work. 2) 71 percent of creative professional produce content in non-English, with approximately 21 percent of respondents indicating that in 2016 – and moving into 2017 – they have increased the number of bilingual scripts they are producing. 3) When creating content that will connect with a specific target audience, the vast majority opt for a voice actor who could sound like a peer (73 percent want a ‘same age’ voice). This statistic supports other evidence that 2016 was the year of “the approachable expert,” a trend that promises to continue into 2017. 4) Virtual reality will continue to be an emerging trend: “In 2016, we saw an increase in requests for live streaming services, as well as for virtual reality (VR) and 360 content capture,” says Todd Wiseman, President of Man with a Cam. 5) Moving out of 2016, 17 percent of professional creatives report that they are using – or being asked to use – celebrity soundalikes less. Over 27 percent flat out refuse to use the strategy at all. With so many diverging trends and emerging technologies, 2017 is sure to be a year to watch, as the creative industry attempts to define and find its foothold in an ever changing media landscape. 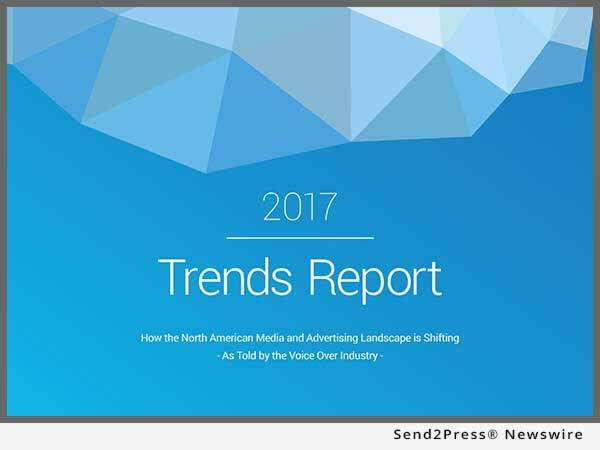 To view the recently released “2017 Trends Report: How the North American Media and Advertising Landscape is Shifting, As Told by the Voice Over Industry,” visit https://www.voices.com/resources/articles/market-research/download-the-2017-trends-report/. Voices.com is the largest online voice-over marketplace in the world. 200,000 talent from around the globe, speaking over 100 languages and dialects, are connected daily to the job opportunities posted by 200,000 clients. These clients include such brands as Microsoft, Hulu, GoDaddy, National Geographic, and Ogilvy.